Fiberglass vehicles should only be repaired by fiberglass specialists. Vettestorations’ technicians understand the importance of accurate body work, body lines, and repair and preparation of the corvette body prior to primer and paint. Using only the best in materials, our certified technicians refinish your Corvette in base coat / clear coat urethane once the body has been expertly prepared. Using a combination of old world craftsmanship and modern world techniques, we are able to do any repair from structural to cosmetic. From the hand laid glass of 1953 to the modern sheet molded compounds found in the present day use, our body and paint department technicians are professionally trained and certified in these applications. your engine and engine compartment, to refinishing your Corvette frame, to minor touch-ups on just one panel. Don’t worry if you get a small scratch on your sportscar, stop by and have us rub it out for you! Not only did Vettestorations do an excellent job on the restoration, they stood behind their work. As a picky Corvette owner, I had a few minor concerns, all of which were addressed and taken care of in a swift, professional manner. Their follow-up since completing my restoration has also been great… they really treat you like you are one of the family. I would highly recommend Vettestorations to anyone considering corvette repair or restoration. Have a cracked windshield or leaking weatherstrips on your Corvette body or convertible top? We repair those as well. We install complete convertible tops too, keeping your corvette looking great! 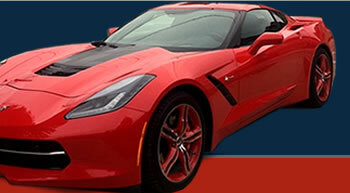 Your Corvette will receive the care and concern you want with Vettestorations, the Corvette body specialists.